By Gordon Frickers 50 x 81 cm (20″ x 32″), Oils, sold. You have found one here, now is your chance. A typical Glen line ship, Glenorchy, is seen here on Thames Reach, London. 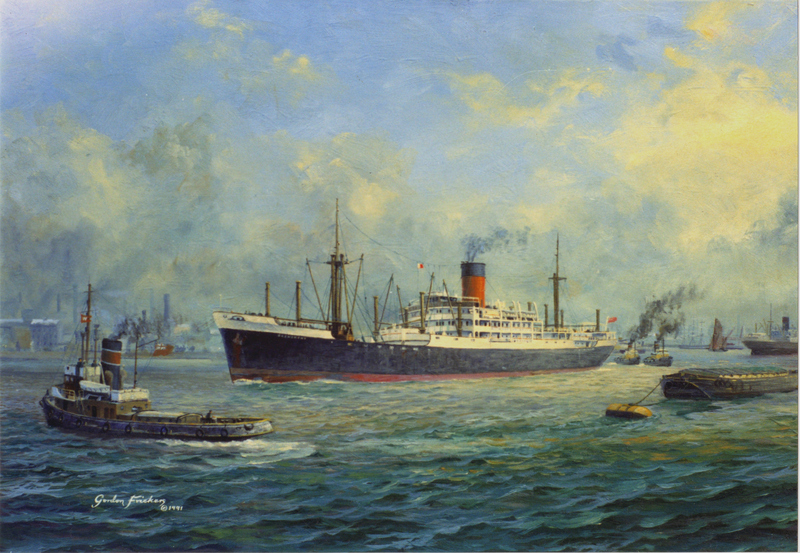 The Original painting was commissioned by and sold to a former officer of the Glenorchy, John Wilson, who wrote on the 12.11.13, “ Delighted to hear that you are well and remember the Glenorchy……….she was a super ship to sail on……….I am still in touch with the second mate; amazing really after 49 years“. She was a super ship to paint too. The atmosphere and colours of the scene are based on the my childhood memories of a busy, smoky, noisy, vibrant river. Glenorchy is being handled by tugs as she makes her way up river. The Thames barges under sail and the lighter on moorings were once a very common sight, taken for granted, now vanished. Here, circa 1954, even the livery of the tugs are exactly correct. By good fortune I spoke to people in the haulage company, Alexander Towing just before they retired. Two of the staff remembered the old Empire class tugs, hastily built in large numbers for war time service, many continued to work into the 1970’s, some operated by Alexander Towing who bought them when Alexander towing purchased business of William Watkins. The tug in the foreground is Sun XVII, although she was owned by Alexander Towing she was at that time still in her original William Watkins colours, as shown here. William Watkins was founded by John Rogers Watkins in 1833 and in 1947 quick to purchase a fleet of government surplus Empire class tugs. The only alteration made to Sun XVII after the war was the fitting of an enlarged funnel. Glen Line originated as the ‘Glen’ name suggests in Scotland. Most of their ships carried the prefix ‘glen’, a glen being a wooded valley. Alan C. Gow and James McGregor families started the business in Glasgow during the mid 1850’s as cargo and voyage brokers who shrewdly grasped the opportunities offer by steam powered ships. The company rapidly expanded to work world wide and in partnership with several other famous merchant ship companies, Shire Lines, The China Navigation Co., China Mutual S.N. 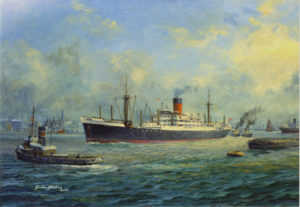 Co, Elder, Dempster Co. Ltd , Alfred Holt & Co the Blue Funnel Line to name but a few. GLENALMOND (2) built 1950 by Vickers, Armstrong & Co. at Newcastle, 10109 grt, scrapped 1974 was the last Glen ship. For further reading to better understand the Glen Line we recommend a visit to the web site ‘Red Duster’ & enter ‘Glen Line’. Contact me, Gordon Frickers if you would like to own a similar painting to “Glenorchy on the Thames“. To make a purchase or commission a similar painting, the easiest way is bank to bank, ask us for details, or using PayPal via the Purchase Page.